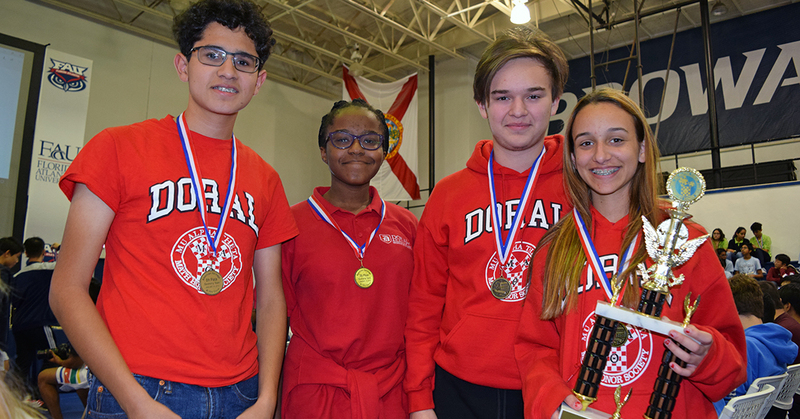 FAU’s Mathematical Sciences Department and the FAU Davie campus hosted nearly 1,300 students from 45 area high schools for the MuAlphaTheta Math Competition on Saturday, January 19, 2019. This was the state’s largest math competition since FAU hosted MuAlphaTheta last year. Students were competing for 250 trophies in six team competitions, six individual competitions, and one school competition. Congratulations to all of the winners that day! Click here to see photos. MuAlphaTheta is a national high school honors organization with competitions across the state of Florida. South Florida is home to a number of schools who are competitive on a national level. In 2017, American Heritage High School in Plantation earned a national championship in the MuAlphaTheta competition, and Marjory Stoneman Douglas High School in Parkland was the national champion several times through the 1990s and early 2000s. Thanks to Charles E. Schmidt College of Science Dean, Ata Sarajedini, who welcomed all of the students to the competition; Provost, Bret Danilowicz, who congratulated the winners; and Associate Professor of Physics, Chris Beetle, who provided a stirring colloquium talk. Thanks to the many faculty and students from the Department of Mathematical Sciences, including: Tomas Schonbek, Lianfen Qian, Natalia Gosteva, Leila Mirsaleh Kohan and Arachna Timsina, Christian Corbett, Scott Jenkins, Lee Klingler, Hongwei Long, and Robert Lubarsky. Special thanks to the Davie campus staff, especially Jane Morgan, Davie Campus Director, who coordinated the event in Davie along with her amazing staff.